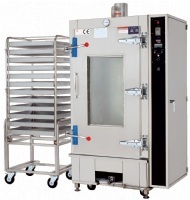 Home / For Visitors / 2019 Exhibitor List / QUICKLY FOOD MACHINERY CO., LTD.
QUICKLY FOOD MACHINERY CO., LTD. is a professional manufacturer of commercial food steamer &warmer! With more than 30 years professional experience in this field we afford CE approval, innovative designed and unique patented products. Our product features are energy saving for gas, labor and time. Our steamer can steam any food you would like to steam, for example, rice, noodle, cake, vegetable, meat, potato and bun.